Azarga Uranium Corp. (TSX:AZZ) is a mineral development company controlling five uranium projects, deposits and prospects in the US states of South Dakota, Wyoming and Colorado and one uranium project in the Kyrgyz Republic. 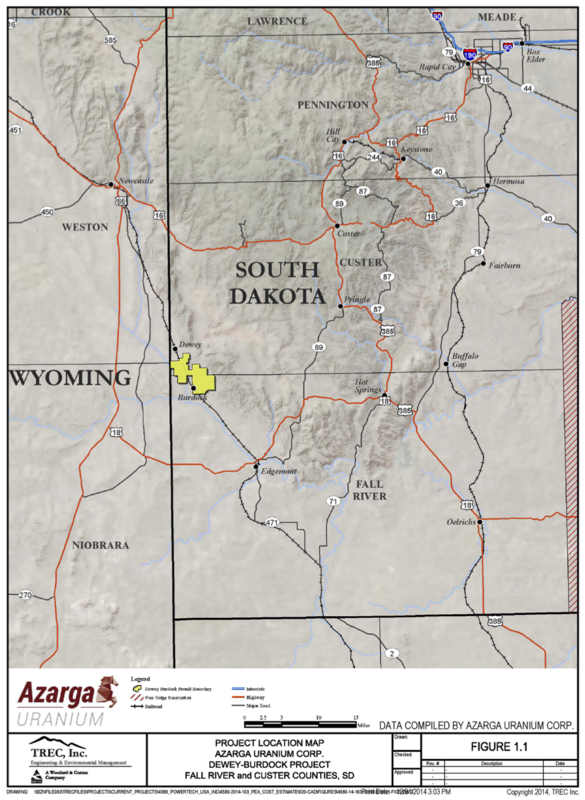 Azarga Uranium’s initial development priority, the Dewey Burdock Project in South Dakota, has received its Nuclear Regulatory Commission License. The company is in the process of completing other major regulatory permit approvals for the project, including those from the Environmental Protection Agency (EPA). Azarga Uranium’s flagship Dewey Burdock Project has an 11-year mine life and is forecast to produce 9.7 million pounds of U3O8, a compound of uranium, with a pay-back period in the third quarter of the second year of production. An initial capital investment of US$27 million for the Dewey Burdock Project is sector leading for a project of its size and the forecast post start-up cash operating costs of US$18.86/lb is first quartile on the cost curve. Azarga Uranium announced closure of a C$2.2 million private placement in September 2016, shoring up the Company’s cash position. The company’s flagship Dewey Burdock Project is the highest grade undeveloped In-situ Recovery (ISR) project among its peer group. ISR is favorable over conventional mining due to environmental and low cost advantages. Initial capital investment of US$27 million for the Dewey Burdock Project is sector leading. Strong demand growth of uranium is expected now at a time when supply is being cut back. Robust economics at low uranium prices. Management is made up of experienced mine developers. The company has a pipeline of projects in the USA and Kyrgyz Republic. The Dewey Burdock Uranium Project is located in the Edgemont uranium district in southwest South Dakota, less than 100 miles from Cameco’s Crow Butte operating ISR uranium project in Nebraska. Azarga Uranium’s 100-percent owned Dewey Burdock Uranium Project is a high-grade ISR deposit and is the company’s flagship initiative. ISR is a mining process involving drilling holes into ore deposits to recover minerals and accounts for more than 48% of uranium production globally. “In uranium, mining methodology is the key. 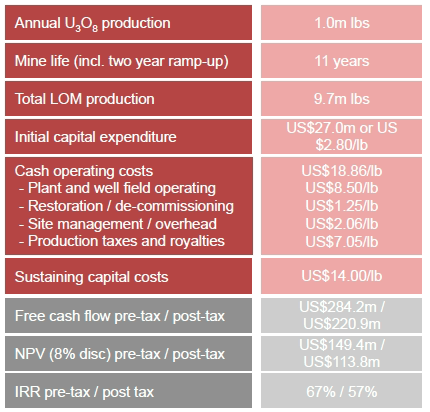 ISR deposits, which require the right hydrological and geological conditions, have lower cash costs on average than conventional mines” said Steele. Through property purchase agreements, mining leases and claims, the project is comprised of about 13,160 surface acres and 17,420 net mineral acres. The Dewey Burdock deposit occurs in the Fall River and Lakota formations of the lower Cretaceous age, consisting of permeable sandstones deposited in a major sand channel system. Uranium occurs in the sandstones as classic roll front deposits favorable to ISR mining methods. Uranium was first discovered at surface in the Edgemont district in 1952, while later drilling projects revealed deeper uranium deposits. The Dewey Burdock PEA resulted in a pre-federal income tax net present value of US$149.4 million at a discount rate of eight percent and an internal rate of return of 67 percent compared to a post-federal income tax net present value of US$113.8 million at a discount rate of eight percent and an internal rate of return of 57 percent. The mineral resource estimate includes an additional 940,000 pounds of non-ISR, located above the water table, inferred resources at 0.17 percent U3O8. 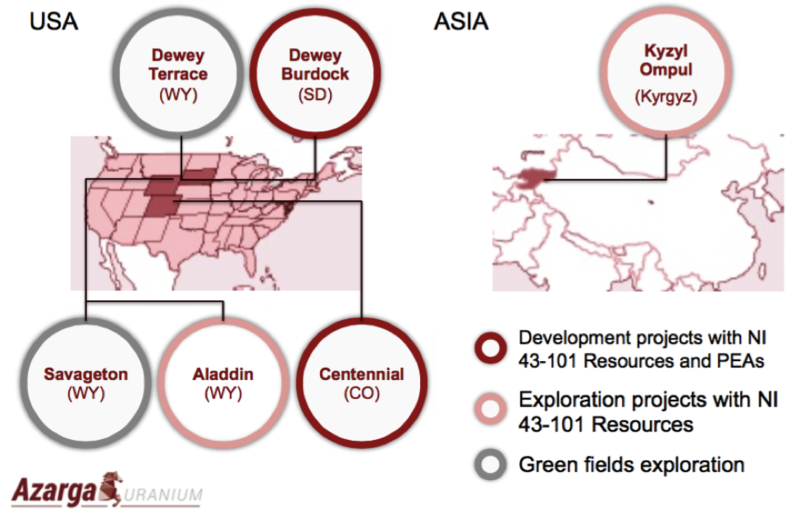 The non-ISR resources are not included in the resources presented in the economic analysis of the Dewey Burdock PEA.In April 2015, Azarga Uranium filed an updated National Instrument 43-101 compliant independent resource estimate and preliminary economic assessment for the Dewey Burdock Uranium Project. The project contains measured uranium resources of 4,122,000 pounds at 0.33 percent U3O8 and indicated uranium resources of 4,460,000 pounds at 0.21 percent U3O8 at a 0.5 grade-thickness (GT) cut-off and inferred uranium resources of 3,528,000 pounds at 0.05 percent U3O8 at a 0.2 GT cut-off in the ISR mineral resource estimate. The company’s immediate objective is to obtain necessary permits and licenses to move the project into the construction phase. The US Nuclear Regulatory Commission (“NRC”) issued a Source and Byproduct Materials License for the Dewey Burdock project in April 2014. The Atomic Safety and Licensing Board (ASLB) partially dismissed contentions on the NRC license in April 2015 while the remaining contentions concerning protection of historic and cultural resources are on a path to completion. The EPA is expected to issue draft Class III and Class V Underground Injection Control (UIC) permits in the near-term. Applications with the State of South Dakota for its groundwater disposal plan, water rights and large-scale mine plan permits have been completed and recommended for conditional approval by the South Dakota Department of Environment and Natural Resources staff. The state is expected to resume the permitting process following federal regulatory approvals. Located in the western part of Weld County in northeastern Colorado, the 100-percent owned Centennial Uranium Project is the second major project for development. Through property purchase and lease agreements, the Centennial Project is made up of about 1,485 acres of surface rights and 6,540 acres of mineral rights. Historical exploration work included drilling, recovery tests, water well tests and environmental studies. In August 2010, Azarga Uranium filed a National Instrument 43-101 compliant independent preliminary economic assessment for the Centennial Uranium Project. The Centennial PEA resulted in a pre-tax net present value of US$51.8 million at a discount rate of 8% and an internal rate of return of 18%. The Centennial PEA assumed uranium prices of US$65/lb U3O8, cash operating costs of US$34.95/lb U3O8 and capital costs of US$71.1 million. The Centennial PEA included indicated uranium resources of 10,371,571 pounds at 0.09% U3O8 and inferred uranium resources of 2,325,514 pounds at 0.09% U3O8 at a 0.20 GT cut-off and annual production of 700,000 lbs per annum, which resulted in a 14-year mine life. The majority of the major mine permit applications for the Centennial Uranium Project have not been prepared or submitted to date. The company continues to analyse scenarios for future development of this property. Richard Clement was the Deputy Chairman from February 2015 to August 2015, and the President and Chief Executive Officer from May 2006 until February 2015. A director since May 2006, Clement is a geologist with 30 years’ experience in uranium corporate management. He spent the early part of his career with Mobil Oil Corp., where he was responsible for operations management of uranium exploration in the United States. He also developed a worldwide mineral exploration strategy for Mobil. In 1983, he joined Uranium Resources Inc., a US company specializing in ISR development. He later became President of Uranium Resources’ New Mexico Subsidiary, Hydro Resources. Clement stayed with Hydro Resources until 2000, where he was responsible for securing the company’s mining permits for ISR development. Blake Steele began his career with Deloitte & Touche, where he worked in both audit and financial advisory practices. Before joining Azarga Resources, which merged with Powertech Uranium to form Azarga Uranium, Steele worked at SouthGobi Resources as Director of Finance where he previously held the position of Manager, Corporate Development. He holds a Bachelor of Commerce degree from the University of British Columbia and is a Chartered Accountant and Chartered Business Valuator in Canada. John Mays brings more than 20 years of engineering experience in the uranium industry, focusing on ISR mining in both the US and internationally. He has experience in all facets of ISR mining spanning from design, construction, and operation of ISR uranium mines. From 2006 until joining Powertech Uranium, Mays served as the Chief In-situ Mining Engineer at UrAsia’s three ISR projects in Kazakhstan, and later at Uranium One. Prior to joining UrAsia, he held the position of Senior Mining Engineer with Searles Valley Minerals of Trona, California. Mays also held the position of Superintendent of Well Field Construction for Power Resources Inc. on both their Smith Ranch and Highland Uranium Project in Douglas, Wyoming. He holds a Bachelor of Science Degree in Chemical Engineering and Petroleum Refinement from the Colorado School of Mines and is a licensed professional engineer in South Dakota and Colorado. Curtis Church has been involved in the resource sector for more than 16 years, eight of which were in Central Asia. Prior to founding Azarga Resources, which merged with Powertech Uranium to form Azarga Uranium, Church held several positions, including Chief Operating Officer at Southgobi Resources, a coal production and exploration company listed on the TSX and HKEx with assets in Mongolia. Throughout his career, Church has received a wide variety of training ranging from mining, people management, safety and even firefighting. *Disclaimer: The profile provides information which was sourced and approved by Azarga Uranium in order to help investors learn more about the company. Azarga Uranium is a client of the Investing News Network (INN). The company’s campaign fees pay for INN to create and update this profile page, to which links are placed on Investingnews.com and channel newsletters.